Hydrangea season is here at last and our side garden is now filled with glorious pink, purple and lavender blooms. Every year the plants get larger and now they are almost as tall as I am. If I don't get busy pruning, we may be growing hydrangea trees instead of bushes by next spring! In this area, the native soil turns some varieties of blue flowers pink after a year or two in the ground. Although the pink is lovely, I grew restless with it this year and tried to turn them back to blue by adding a soil acidifier. It worked a little bit and now they are purple. I usually apply new products with a light touch and only did one application of the acidifier in early spring. Next year I'll know to make generous and frequent applications for a more vibrant blue. Still, I am very happy with the purple hue for now as it blends beautifully into bouquets and is slightly different that what we've had before. 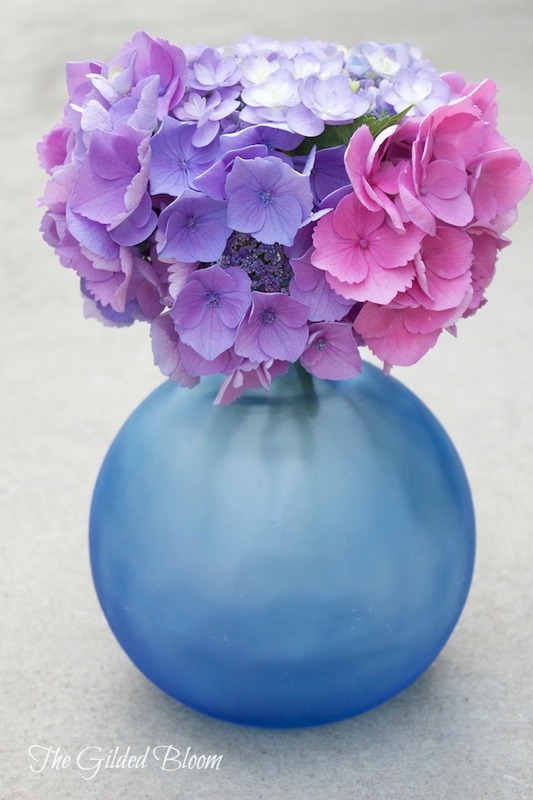 The arrangement of lacecap and mophead hydrangeas above shows the transition in color from pink to purple. We grow several varieties of hydrangea but the most delicate of all is the Angel's Parasol pictured above. This is often considered a premium florist's potted hydrangea not a landscape variety but ours has unexpectedly grown into a huge bush in a shaded and protected area of the garden. When its soft velvety petals emerge it is always a clear signal that summer is on the horizon. 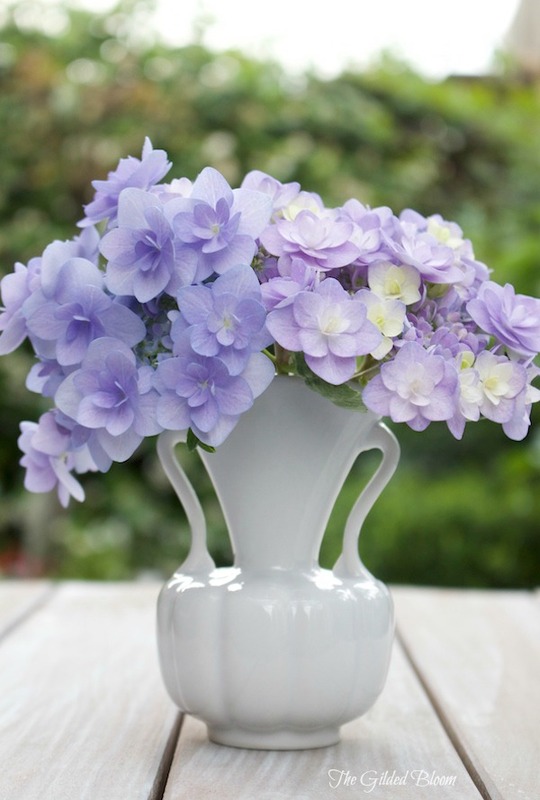 This plant was originally a light periwinkle and the color has turned more lavender over the years. After adding the soil acidifier, you can see that some of the blooms appeared in a cooler and brighter purple. 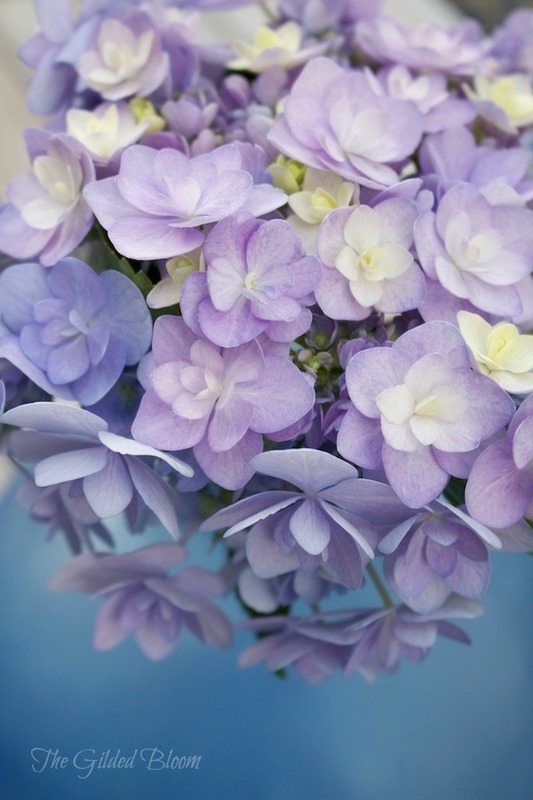 Hydrangeas make excellent cut flowers as long as they are kept cool and hydrated with fresh water. To create these simple summer displays I chose a blue beach glass bottle and a classic white porcelain vase to hold the blooms. oh my goodness! Your photos are truly magical! 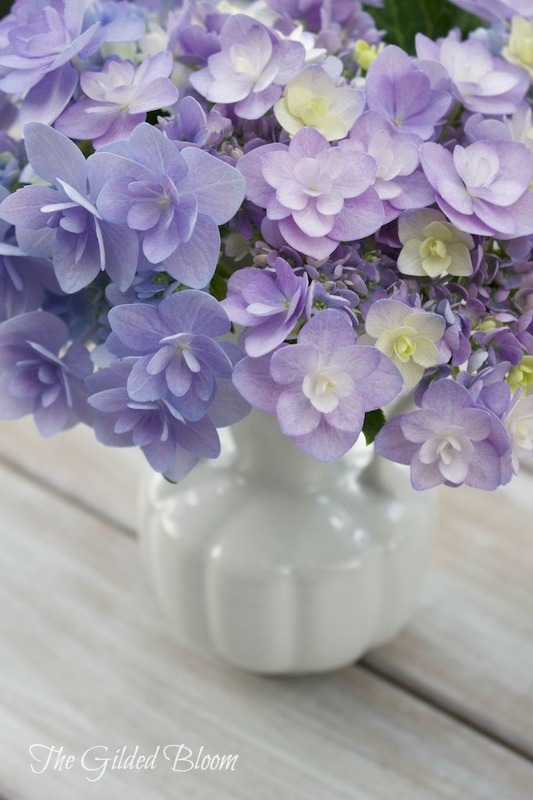 I love hydrangeas, and you have captured their very heart and soul. Thank you so much Lidy! Hydrangeas are fun to photograph because the petals have such unique color and texture. So glad you visited!